More than four years ago, I published a post on making an economy block. One aspect of quilting many struggle with is the math. The linked post outlines all the math in steps, and also provides a cheat sheet for a number of block sizes. To show the steps, I fussy-cut a kitty from a bit of fabric and surrounded her with corners of a lively pink and yellow print. Those were set again with a bright pink and white gingham. This block measures 7″ finished! Just as I wanted. Cute block, huh? But with the quilts I make, not very easy to use. After all, the finished size is only 7″. For a block quilt, I’d need a lot more blocks (in pinks! or other pastels!) to make it useful. For a medallion quilt, 7″ is pretty small for a center. When I started prepping for my February retreat, I dug through my drawer with orphan blocks and other parts. This block called to me, so I pulled it out and considered how to use it. By framing it with the yellow floral print, I enlarged the center, and the striped border extended it visually even more. And use them up I did. Here is the finished quilt. A Kitty for Charlotte. 39″ x 39″. Finished April 2018. Photo by Jim Ruebush. From a design standpoint, the small center block is okay, given the size of the quilt. One reason it works is because the 4-patches with pink gingham point at the center, directing the eye there. Also, there is not a lot of other “design” to distract from it. Using the powder blue frames and other blue patches helps moderate the warmth (and monotony) of the pinks and yellows. The dark pink gingham repeats the dark pink in the kitty’s dress and bonnet. Also it provides some value contrast to the paler pastels. Spreading the gingham out across the quilt, and binding it with the same, helps provide balance. Jim and I have friends with a baby girl named Charlotte, whom we have not yet met. The family lives just around the corner from us. This quilt seems like a good way to welcome Charlotte to the neighborhood. This entry was posted in Medallion Quilts, Quilting and tagged Balance, Color, Contrast, Economy block, Orphan block, Process, Stash, Value on April 20, 2018 by Melanie McNeil. Double pinks, sometimes called ‘cinnamon’ pinks, feature tiny prints in a dark, cinnamon-like pink, on a light rosy pink ground. Both of these hues have warmer undertone than bubblegum pink, which emerged as a quilt fabric, often as a solid rather than a print, in the twentieth century. 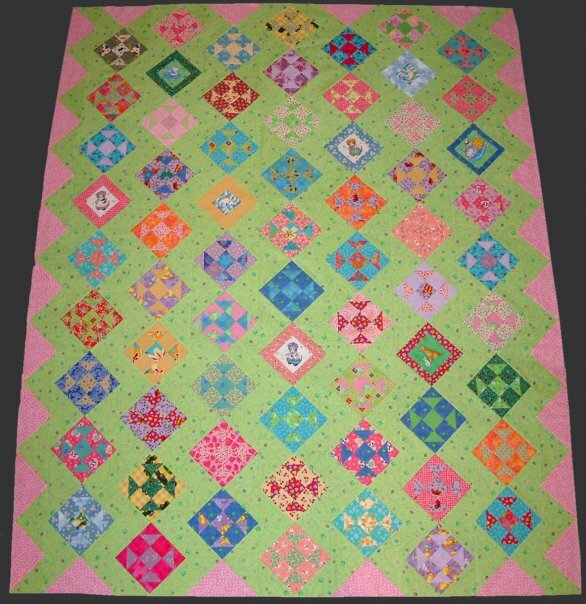 Double pinks were most popular in the 1860s, ‘70s, and ‘80s, though double pinks are common in quilts through the 1920s. 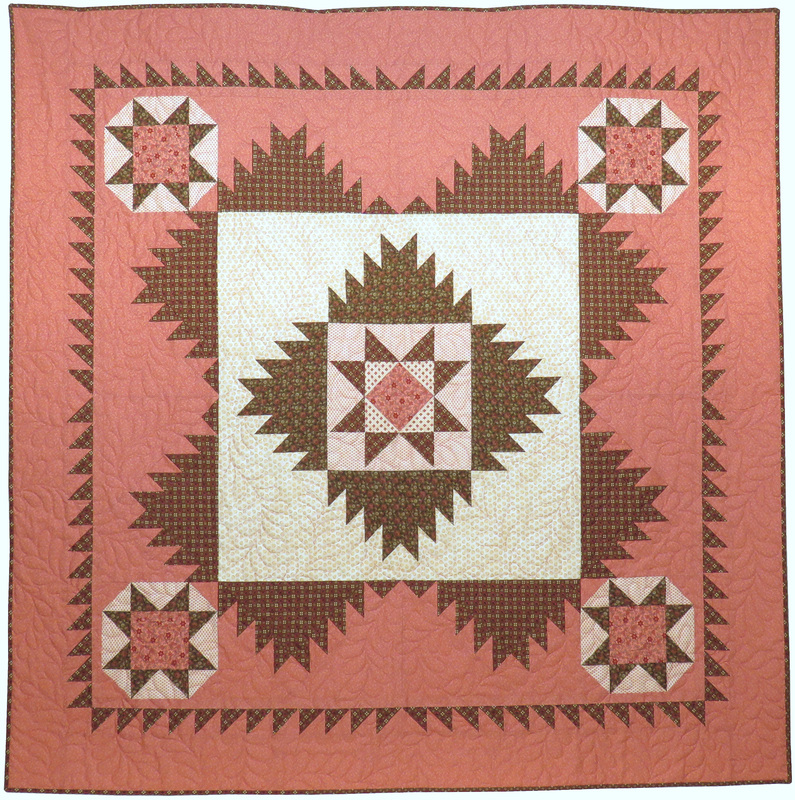 At the height of their popularity in the mid-nineteenth century, double pinks were often paired with madder or chocolate browns in quilts. 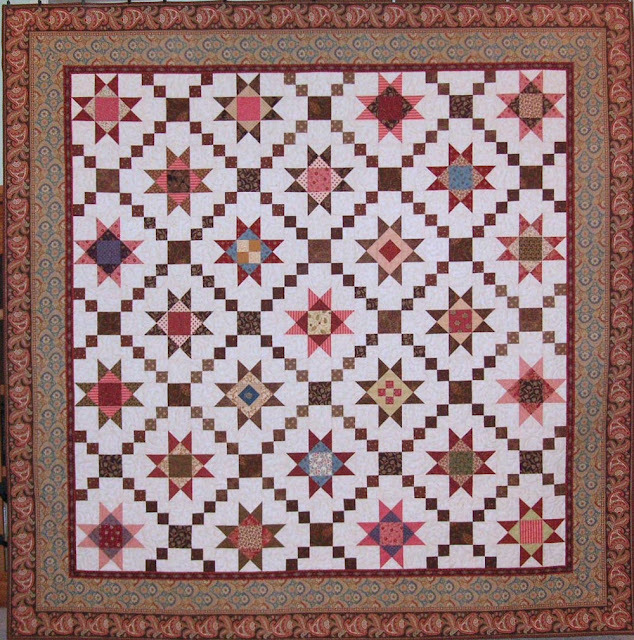 At the same time double pink and brown was most popular, medallion quilts were on their way out of favor. Medallions in the early 1800s included whole cloth such as whitework, broderie perse, and pieced quilts with both regular and irregular border forms. Delectable Mountains quilts might be an example of “regular” borders, with some uniformity of style, color, and value from the center to the outside edge. 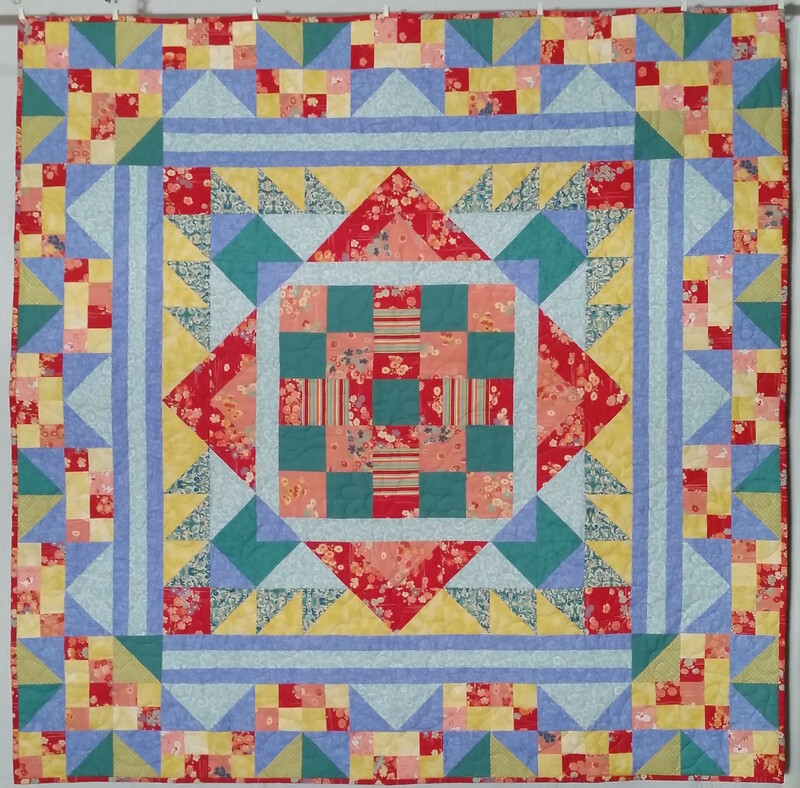 As the medallion quilts lost popularity, block quilts became the dominant style. In the last few years I’ve made three different pink and brown quilts. The colors appeal to me partly because the double pink is very strong — while it is feminine, it is not timid, but boldly shows itself. The first pink and brown quilt I made was a block quilt for a family friend, for her college graduation in 2011. I love the Ohio Stars with chain blocks, and the border stripe fabric framed them perfectly. College graduation quilt for a friend — still one of my favorites. It’s about 81″x81″. 2011. My other two pink and brown quilts were both made last year. One was the Delectable Mountains quilt from early in the year. Delectable Mountains. 61″ x 61″. Finished spring 2017. Photo by Jim Ruebush. And the other was Union, which I showed you a few days ago. Union. Finished December 2017. Photo by Jim Ruebush. 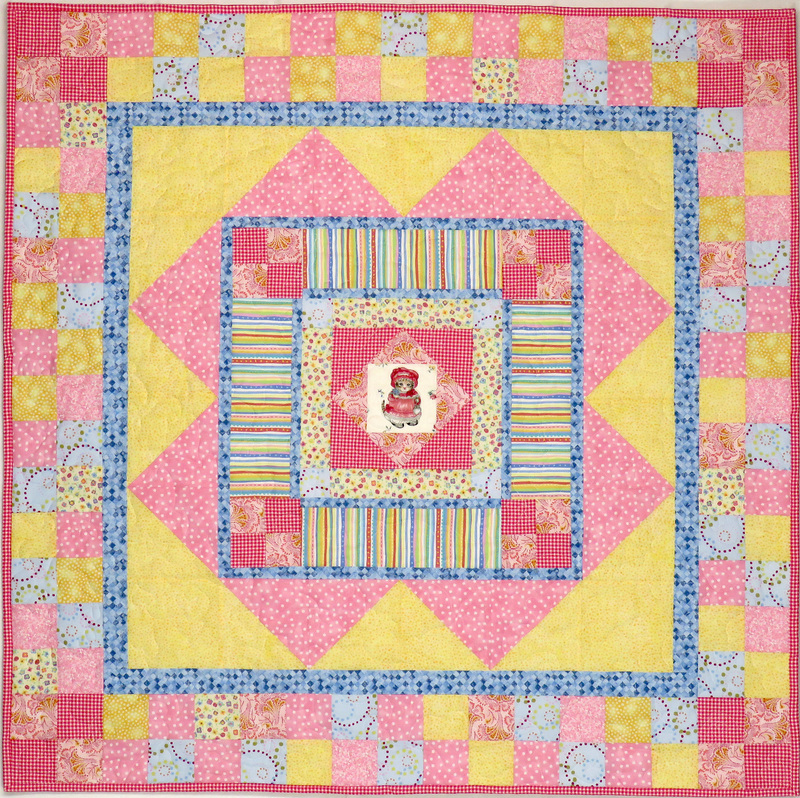 When I finished piecing Union, I was still enjoying working with the pinks and browns. Since I still had them out, I began a new quilt featuring them. 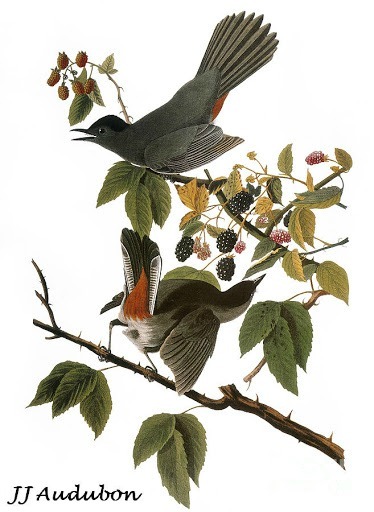 The new one, however, will expand its palette by including reds, olive greens, and teals. After it is finished, I’ll probably be done with the double pinks for a while. Do you have color combinations you use repeatedly? Do you have a reputation for using particular colors? (I’ve seen that happen!) If you were limited to four colors of quilting for the rest of your life, what colors would you choose? This entry was posted in Quilting and tagged Block quilts, Color, Delectable Mountains, Double pink, Pink and brown, Quilt history on January 19, 2018 by Melanie McNeil. I continue to think about “interesting,” because I want to make interesting quilts. I want them to challenge and engage me in the process, and I want them to engage the viewer/owner when done. Keep in mind that you don’t have to like a quilt to find it interesting. It doesn’t need to be “pretty,” or in a style you prefer. It doesn’t need to be one you’d like to make yourself. There are three other things, or perhaps more specific characteristics, that I’d like to include on that list. They are color, combination of fabrics, and story. Our individual preference for a particular color associated with these objects (a living room wall or an automobile) will be produced and reinforced by the positive feedback associated with the object and the color it has. Everyone has a somewhat different life experience, and so as people increasingly experience pleasure in something they bought in a particular color, they will tend to chose similar objects in the future with the same color. This leads to a self perpetuating situation. So color preferences help keep us safe, by choosing foods and other items with which we’ve had a good experience. We choose clothing colors that either show us off or protect us, depending on our needs. Some quilters I know prefer bright, saturated colors, while others reliably choose earth tones or muted hues. If you usually quilt with 1800s reproduction fabrics, you will probably notice, and spend more time looking at, quilts made with similar colors. Recently I did a guild presentation with trunk show. More than once I found myself thinking, about my own quilts, that I’d used an unusual color combination. 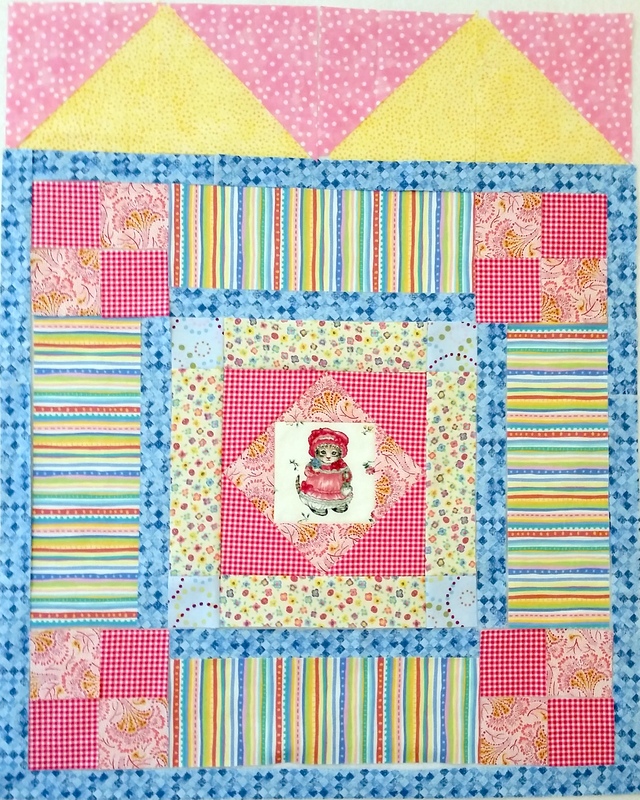 For example, the quilt below uses red, coral, teal, aqua, periwinkle, lemon yellow, and acid green. Certainly the colors aren’t the only thing going on, or the only reason someone might look at this. (And they’re not necessarily ones you like or would choose! It’s okay if you don’t like it.) But I’m not sure I’ve ever seen another quilt with this combination. Contrast this with Dizzy, which I showed you in the last post. The few colors are pulled directly from the print floral in the middle border. Because the floral sets the palette, there is no surprise in the colors of other fabrics used. Combination of fabrics and story are two more factors that create interest for me. I’ll discuss those more in a couple more posts. This entry was posted in Quilting and tagged Color, Design, Designing, Original design on December 18, 2017 by Melanie McNeil. These days, HGTV is focused on total house renovation, largely done by hired contractors, and selling fantasy homes. In the old days, many programs looked at the smaller scale of crafts and DIY home decor. Those old shows, and current ones like Craft in America on PBS, elevate making as a means of expression, and as a source of pleasure in transformation. As I watched those shows I remarked more than once about my wish to make beautiful things by my own efforts. But though I took a couple of drawing and painting classes, and occasionally bought craft supplies to try at home, I had no particular skill or talent for it. Sometimes I’m still surprised at my journey into quilting. In my first experience fourteen years ago, I cut measured squares using a ruler, pencil, and scissors. I sewed them with seams as wide as the presser foot edge. The machine’s tension wouldn’t hold, leaving me repeatedly frustrated. Once my quilt top was assembled, I used tack stitching to hold the layers together. I pinched together wide bias binding, from a package, around the edge and top-stitched. It’s amazing that little quilt held together as long as it did. The effort was not very satisfying, much less inspirational. I was not transformed into a quilter, but I enjoyed choosing fabrics to go together, and deciding how they would be arranged. Perhaps that’s what spurred my second quilt. It also was from squares, but I had a new sewing machine and basic tools of rotary cutter, a ruler, and mat. Having better tools allowed more pleasure from the process, as well as a better product. The tools we use include more than the tangible ones like rulers and mats and machines. They also include the skills and talents we develop over time. I remember in the early days of my quilting having to think about each step as I made a small table runner for a friend. My goodness, it was hard! 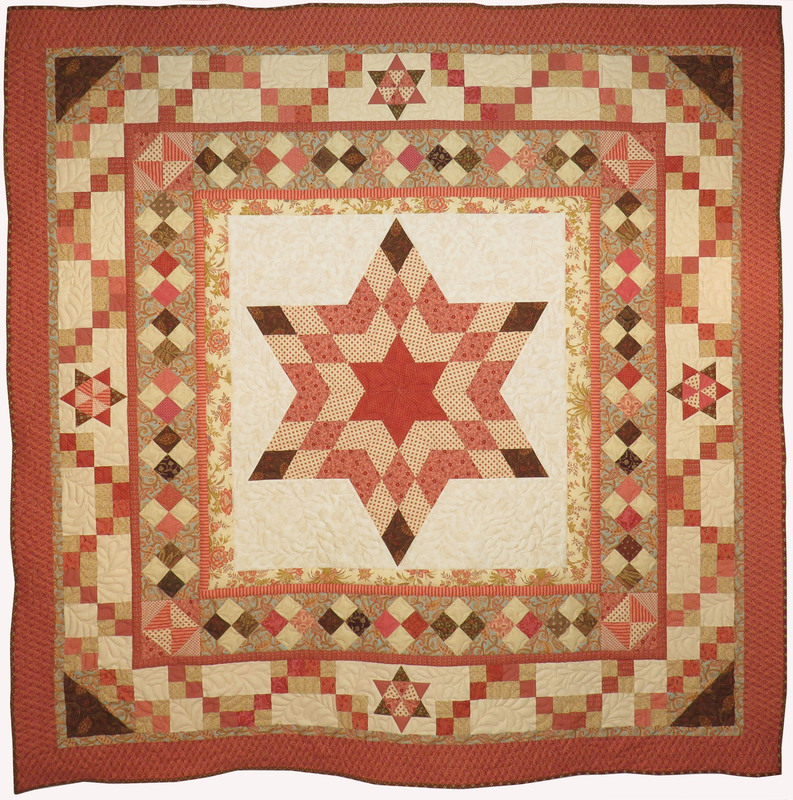 Terri’s Variable Star Table Runner, about 8.5″ x 25.5″. From my early days, maybe 2006. Besides the books, I started subscribing to American Patchwork & Quilting. Here, too, were patterns that I misunderstood as ideas and inspiration. Though I made a few quilts over the years based on the beautiful projects they showed, I always changed things, subbing a different block into the setting, or changing the size. The quilt below uses the “streak of lightning” setting I saw in an APQ project, though nothing else about it is the same. Em’s Bed Quilt top (unquilted.) Streak of lightning setting. From about 2007. I don’t have a photo after it was quilted and bound. Though I always designed my own quilts, it was many years before I thought of myself as a designer. In fact, that thought came to me about four years ago, at a specific moment, which I wrote about here. While that recognition didn’t change what I do, it did help change how I do it. Seeing myself as a designer made me take design more seriously. Design is something that can be learned, and can be taught. I started studying design principles generally, but specifically related to quilts. I learned about unity, balance, proportion, and movement. I learned how design elements such as color, value, shape, and size contribute to the look of the quilt. And I began to evaluate more carefully what I see and what I make. Evaluation allows me to identify both challenges and opportunities for meeting them. Currently I’m developing quilts for the class I’m teaching on medallion quilt design. Sometimes when I’m making a quilt, something about it strikes me wrong. Does that ever happen to you? 🙂 I got this far on one of my tops, and was dissatisfied. I knew the problems, but I wasn’t sure about the solution. The first border of batik around the bear’s paw center block is cornered by fussy-cut flowers. I liked the effect at first, but as I surrounded it with more borders, it bothered me more and more. (Construction note: I used separate blocks, including half-square triangles, to form the borders that create the on-point look. The blocks allowed better precision of placement than I would get by creating large triangles to set on point.) The last border in the picture above is also batik, and it is cornered with more of the red used in the interior. What didn’t I like? Those corner blocks. Though small, they have a lot of effect on the look. In the interior corners, the black print with red flowers bled into the surrounding fabrics. It wasn’t distinct enough from the batik, the black print, or even the red. On the outside corners, the red is simply too hot. Another problem is that I’ve limited the number of colors I can use in later borders. There are various blues, greens, golds, and browns in the prints. However, the large sections of aqua, red, and butter yellow make introducing more colors awkward. The simplest solution to both problems is to change the corner blocks. I looked for blue in my stash that would emphasize the blues in the batik. I had one small piece, about 10″ x 15″. (This isn’t unusual for my stash. I usually buy a yard at a time, but the way I use it, often in small amounts, ultimately leaves me with small amounts.) I cut squares to replace the eight corners and covered the ones already sewn in. Immediately I was happier. The blue transformed the piece, making it cooler and simpler, and allowing blue as another color for outer borders. As I create my class projects, I explain to my students some of my process, using the jargon of design. Explanation clarifies for both them and me. And I ask for advice and help at decision points. They, also, present their work, and the group provides constructive input. Over the series of classes, they become more confident in their choices. Some who have never designed their own quilts before are guided through the process, transforming themselves at the same time. One could define “transformation” as the act or process of being changed. Some synonyms are change, alteration, and metamorphosis. A “metamorphosis” is the transformation into a completely different form, unrecognizable from the beginning. My metamorphosis over many years has taken me from someone with no apparent artistic skill, to one who can change pieces of fabric and thread into things of beauty and utility of my own design, and to one who can teach others to do the same. I like this form, and I look forward to what comes next. 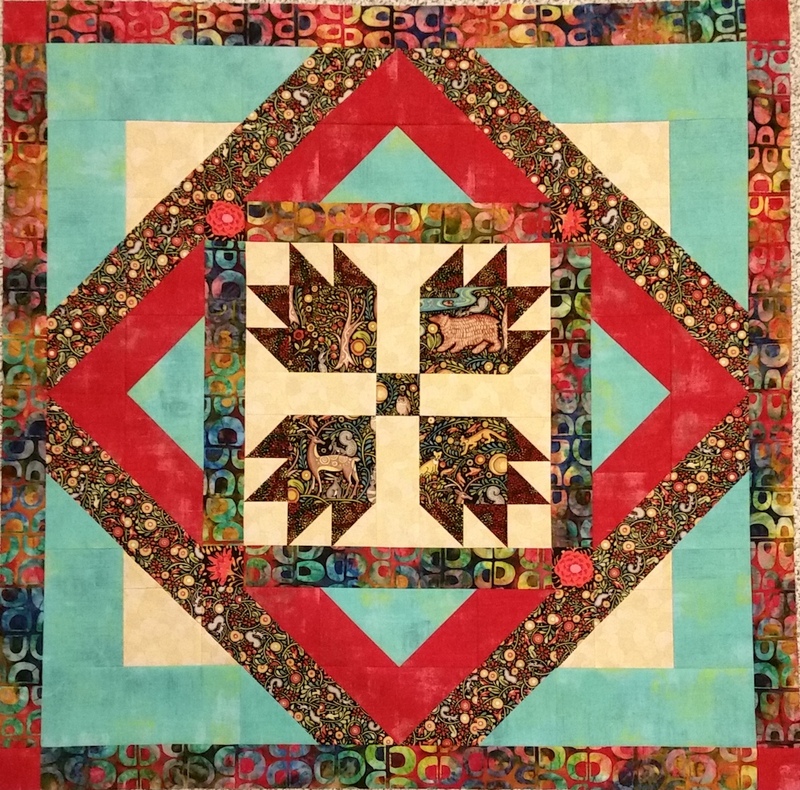 This entry was posted in Creativity, Personal, Quilting and tagged Color, Power, Process, Solving problems, teaching, Transformation on October 22, 2017 by Melanie McNeil. When I teach Medallion Improv!, I use a blueprint specifying the size of the center block and the widths of each border. This frees the student from concerns about those proportions, allowing them to focus on other aspects of design. Even with a blueprint, each student’s quilt will be completely different from every other, including mine. Each begins by creating their own center block. 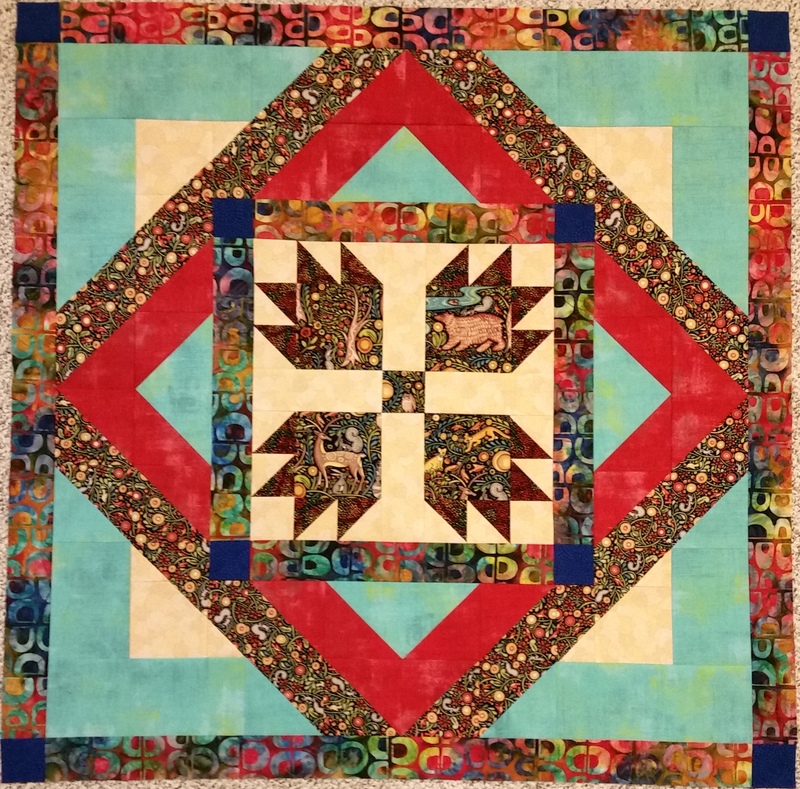 In so doing, they begin to define the style or theme of their quilt, from traditional to modern/contemporary, from casual to quite formal, from couch throw to heirloom to large wall-hanging. I’m starting to prep for classes this fall. I’ve redesigned the blueprint to hone in on a couple of specific lessons. For example, using a center block on point requires knowing how to do that, as well as which blocks are appropriate for turning and which are not. Designating a border of half-square triangles demonstrates how many different ways they can be arranged, and shows how very simple blocks can be used to create a big impact. The blueprint’s center block is 16″ square, finished. (It could be no less than 15″ and no more than 16″ and still work easily. Smaller sizes would require some amendment.) Here is my first of two center blocks, already turned on point. As you can guess, this is for the quilt that will be less traditional! The variety of design elements in the star block create interest. (Note varying shapes, sizes, colors, values, and patterns. All of these are “design elements,” or the characteristics that add together to create the overall look. ) The lines in the fabric patterns, as well as the spinning star in the middle, provide a sense of movement that is both outward and rotational. The colors reinforce each other, with the red and black in the outward stripes repeating the red and black of the pinwheel patches. The various oranges and orangey-yellows give depth, and also invite any other orange or yellow to join in. The dark blue of the star background isn’t repeated yet, but it will be in the first border. The prints used, while emphasizing stripes, also include squiggles, bars, circles, and even floral. Having such a range in the center opens the door widely for what might come next. The setting triangles are pieced from two different stripes. In truth, I had a hard time figuring the math to cut the orange squiggled fabric efficiently. So I didn’t. I just cut rectangles I knew would be big enough, and after piecing with the red and black stripe, cut the big triangles to fit the edge correctly. See my post on setting a block on point. I have LOTS of stuff going on right now, so I’m not sure if I’ll work on this again next, or switch gears to the other class quilt, or … could be something else altogether. Either way, it was fun to make this block and I think it will make a big impact as the center of a quilt. 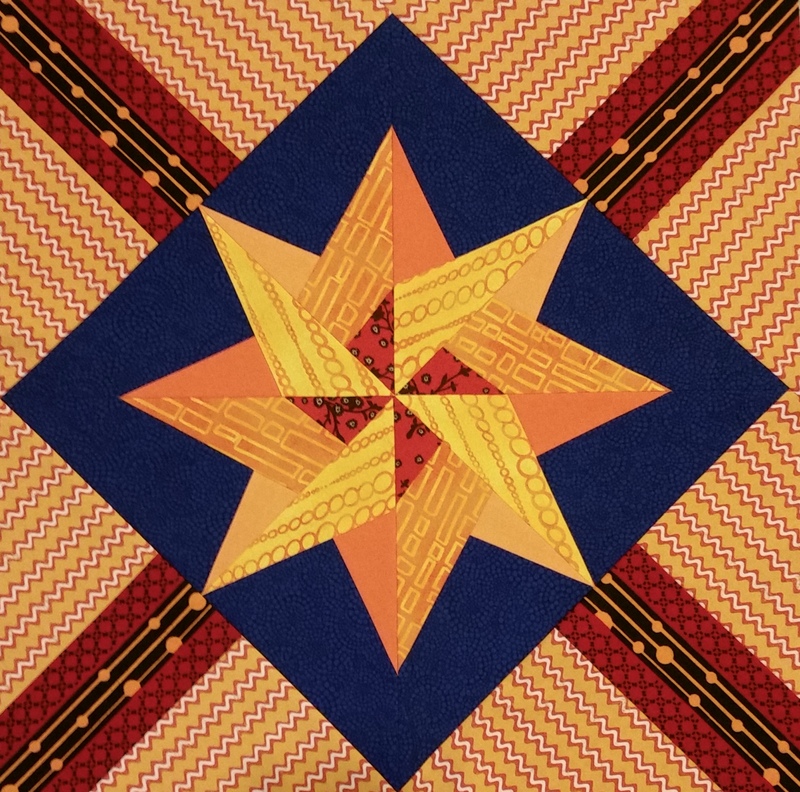 This entry was posted in Medallion Lessons, Medallion Quilts, Quilting and tagged Center block, Color, Design elements, Design-As-You-Go, Movement, Original design, Pattern, Process, Proportion, Shape on April 28, 2017 by Melanie McNeil.